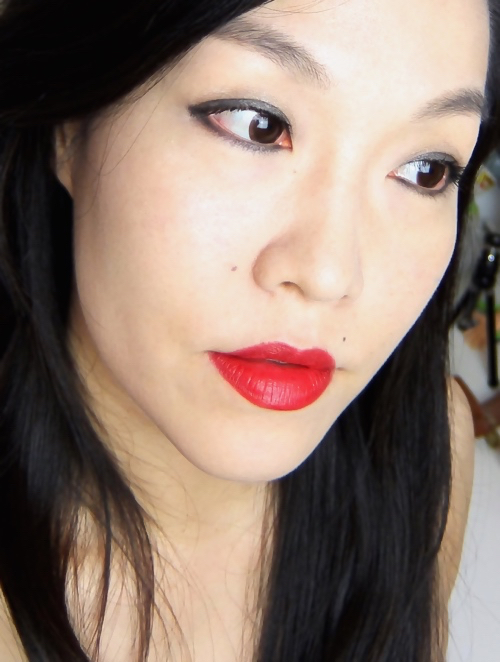 As promised, here is a very simple look with MAC Ruby Woo Lipstick. 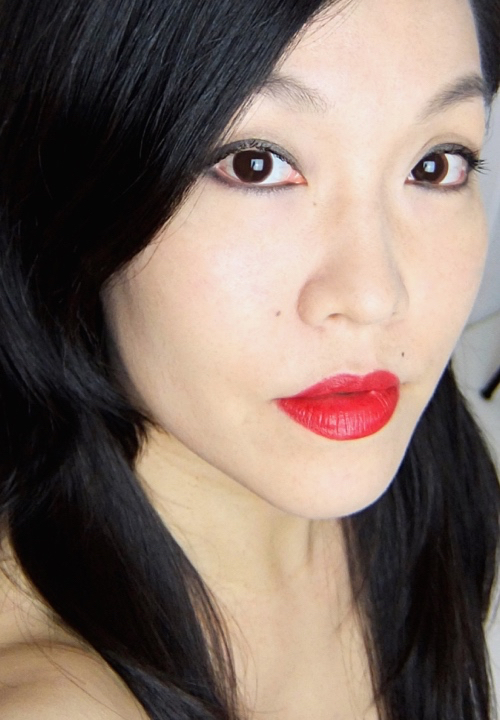 Please see my overview on the MAC Keepsakes Red Lip Bag for swatches and comparison. MAC Ruby Woo is probably the only opaque red that I can decently pull off. In my opinion, what makes this blue-toned red so unique is the ultra matte finish, not the color itself. There are many similar ones out there, but other finishes (satiny, creamy, glossy,..) combined with this already intense color does not really work on my complexion. Which is why I cannot pull off Ruby Woo Lipglass by itself although it is an amazing color for sure. This is pretty much with one coat and I actually sheered it out quite a bit, so you see it is a great choice if shiny opaque gloss is your thing. Formula wise, it is a vast improvement from the last MAC Lipglass I had. I have no complaint. It is much like the reformulated NARS Lip Gloss. When blotted lightly, it leaves a really natural and flattering stain behind, which also lasts for a while. And this actually makes a great base for MAC Ruby Woo Lipstick! I suppose you could put on the Lipglass on top of the Lipstick to boost up the color and add moisture, but that is just too much for me and rather pointless since I like the matte finish. It is recommended to prep your lips with lip balm before applying Ruby Woo Lipstick. However, those emollient slippery types don't work with the matte formula. Waxy ones like Burt's Bees Lip Balm are your best bet. I've tried this and it works well for the initial application, but I still find it doesn't help by much regarding the drying effect. This waxy lip balm/Ruby Woo lipstick combo still leaves my lips parched by midday. 1. put on a very little amount of emollient balm (like Smith's Rosebud Salve) on the lips and smooth it out carefully. 2. Let it sit so it can be absorbed. This may sound too complicated, but I promise you it isn't so bad. Most importantly, it is totally worth the time and the effort. You can skip the step 4 and 6 if you don't have the Lipglass or the Pencil. The result is similar. I was out all day wearing Ruby Woo and I was really surprised to see how well it stayed on my lips. It was windy but I didn't have to suffer the pain of hair sticking on the lips. My lips felt comfortable, too. Although it is very resistant to drinking, you will see some patchy spots after eating greasy stuff especially in the middle. Reapplying Ruby Woo Lipstick won't work in this case (it simply wouldn't adhere to the wet bald spot). The Lipglass comes to your rescue, though! Smooth on a little bit of Ruby Woo Lipglass in the middle and you're good to go again. A drop of Shiseido Sheer And Perfect Foundation mixed with two pumps of Giorgio Armani Fluid Sheer 07 was used for a sheer yet luminous base. Powder and blush were skipped. For eyes, I just defined them using Viseé Smoky Rich Eyes GY-7 (told you its "nothingness" is useful sometimes). This is a minimalistic look that also goes well with eyeglasses. Hope this post is helpful for those who find Ruby Woo Lipstick impossible to wear due to the drying formula. With a bit of additional effort, Ruby Woo actually could be low maintenance compared to some of the red lip colors out there. Having the set with the same shade of Lipglass and Lip Pencil definitely makes it easier, too. Do you own a Ruby Woo Lipstick? What is your trick to use this lipstick with rather fussy formula? Hey Lena, the combo is gorgeous on you! I'm so sorry to hear none of the three products works well enough on its own though. I am too lazy to do this much layering. If I bust a lip brush or lip liner out, it's already me having a lot of patience! So vampy! Also loving your luminous complexion, I've been obsessed with luminous primers ever since Autumn started kicking in! These are great tips, Lena! I love the color on you - so fresh and classically chic! I agree that it sounds like a lot of work, but in practice it isn't really that much, especially if you really want to wear a red lip, lol! I am lazy, so I like swipe & go lipsticks and glosses, but this is a super convenient set for that perfect killer red lip. Yeah, I believe even regular red lipsticks need that much. I didn't have to go through filling in with lipliner or anything crazy. I'm happy that it isn't all that drying, either. Oh, I thought the color looked gorgeous in the tube, but it looks even more stunning on you. What a vibrant color! Red lippies do photograph well and I really like this red color. The lipgloss looks lovely but WOW the lipstick just bang on your complexion! I've heard and seen nothing but great reviews of their reds and I'm probably gonna cave in one of these days! It is a great retro red and the finish makes it even special. WOW! SO pretty! I wish I could wear Ruby Woo as well as you do! I absolutely love this look! I don't own any matte Mac lipsticks though, they are just too dry. I am a swipe-from-the-tube lip product girl. Thanks for the tips & tricks, Lena! It sounds easy enough for me. I have Riri Woo and it looks like it's a notch darker than Ruby Woo. I think the formula is different, too, as Riri Woo is a retro matte. 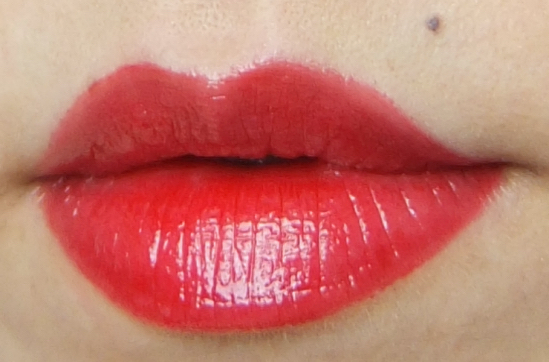 The blotted lipglass is my favourite look, though I really like the punch of red the lipstick gives. I looks absolutely stunning on you! Lovely red lips Lena ! Red makes skin look whiter. Someone said blotting lipgloss seems wasteful, but I don't see why not since it gives a totally different effect. This looks really nice on you Lena! I have to admit to still thinking that Ruby Woo would still be a bit too high maintenance for me. I'm dead scared it'll look super drying on me too! OMG! Blotting out a lipgloss for a matte lip like this is a GENIUS idea!! I am always wary of rocking something like this, but you nailed it! 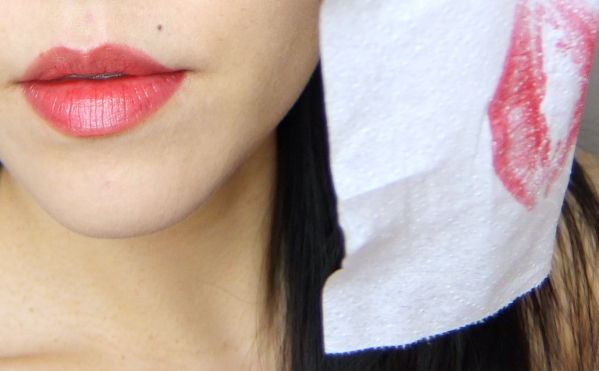 I love the stain that the Ruby Woo lipglass leaves behind <3 the lipstick looks amazing on you too! I was happily surprised with the lipglass stain as well, and been wearing it in the fashion very often! I love it your tips because the result is beautiful, I love it more the result that the matte lipstick!